Oh wow! That is so amazing. Are you able to get up close to them or do they run away? Oh how awesome that would be to have moose wandering around your yard! Well, awesome to look at. I guess you can't really send the kids outside to play with them so close. Not to mention them moose nuggets! I love that photo! It's so surreal- having a moose that close to your house. I agree with Lana and Angie - it's surreal to have them up so close! Did you have problems with them during the summer? Do they do damage other than to the landscaping? Right now there is an excessive amount of skunk activity in our neighborhood. It doesn't help that my kids are always dropping food outside. Every evening I tread outside very lightly because I'm sure to see at least one, and I want to see him before he sees me! I don't know if I'd rather have skunks or moose. At least the skunks do a quick, shaggy, hunching shuffle away in a hurry when they see us. Did you ever read Bill Bryson's book on the Appalachian Trail (A Walk In The Woods)? He gives a hilarious description of moose near the end. I'll transcribe it for you if I can find our copy. 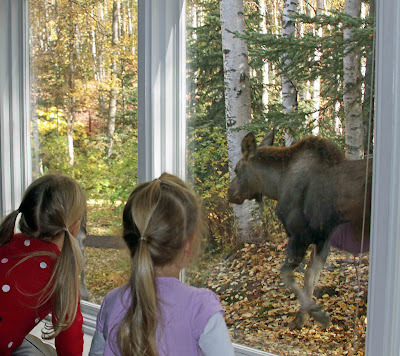 That would be so cool to see a moose up close! My SIL lives in Kenai and my best memories of visiting ar of the moose. Love it. reminds me of when I was with Aunt Cheri. We were walking from her friends house and all of a sudden she told me SSHHH! I looked up and I saw a moose, the biggest thing ever when I was 4! Think Cheri was 17 at the time. That is so cool in your yard though.